Whenever I go out to eat to Texas Roadhouse, I always order their loaded sweet potato as a side. I LOVE it! Well, I got a craving for one last week and decided to make them for our side dish. They were DELICIOUS! Rinse a sweet potato under running water (using a vegetable scrubber is good if you plan to devour the potato skin), pat dry, and prick the potato all over with a fork. Line a small baking pan with parchment paper & put your potato on top. Bake for 45-50 minutes for a small or medium size potato or about 1 hour for a large potato. While it’s baking, make glaze topping. Combine melted butter, brown sugar, cinnamon, and vanilla. When potato is finished cooking, cut it open lengthwise, be careful, potato will be HOT! Stuff a handful of marshmallows inside. Pour butter/sugar mixture on top of the marshmallows. Then add another handful of marshmallows. 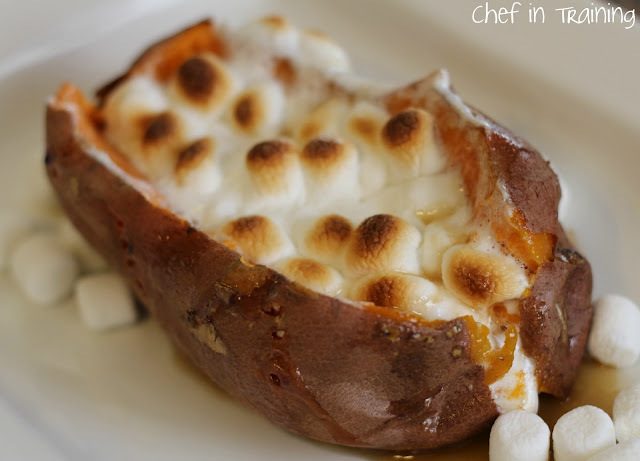 Turn oven to broil and put potato back in the oven until the tops of the marshmallows brown. Keep a close eye because this happens fast (about 1 minute). While waiting you can sprinkle a little cinnamon on top if you would like. OMG!! me too!!! it's my favorite! !This looks sooooo yummy!! Oh I am pinning this! I have never had one of these, but I need to; it looks delicious! We went the other night, and I was sad that they were out of these potatoes. I appreciate the link, thanks! Oh. Yum. I want one now! I think I'll be running out to the store. Oh wow!!! 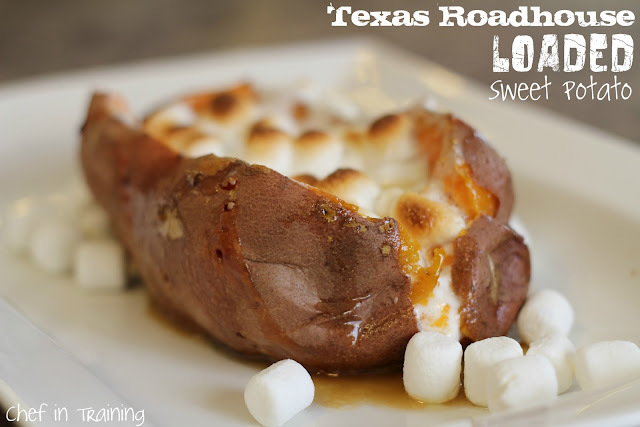 I love sweet potatos I am going to make this for lunch for lunch. Oh this looks amazing and I love your pictures! I'm making sweet poatoes tonight, I have been craving it!! This is my husbands fav from Texas Roadhouse, we just went last Friday for his bday. I try to duplicate at home..never knew about the cinnamon or melted butter, so THANK YOU, he will be sooo excited! Would you believe that i've never had marshmallows with SP before? I know! Might need to try this out! Its so pretty! Mmm, this looks delicious, thanks for the recipe! I have a whole bag of sweet potatoes that are just screaming for this recipe. I know what I'm having for dinner tomorrow! I have to say that for an Australian, that just looks wrong LOL! I was so disappointed... My sweet potatoes came out hard - even after an extra 25 minutes in the oven. I don't know what to do but this always seems to be the case and I love sweet potatoes! For perfect sweet potatoes every time - wrap in plastic Wrap and pop in microwave for 10 minutes on high. (That's for a large potato - less time for smaller potatoes) I do white potatoes this way too. Why hello there beautiful. Get into my belly now! Thank you! Had one of these a few weeks ago at their restaurant and can't stop thinking about it!! !